This was picked up during a weekend trip to Seattle. After being outside in the sun, nothing sounded better than a nice, tart, refreshing beer. This one did not disappoint. Appearance: Cloudy, straw, a little murky. Great big-bubbled head with good retention at least halfway through the glass (thank you wheat!). Smell: Not too much aroma. There’s just a hint of that classic Belgian white smell with a little spice and orange butting up against the malty wheat. Taste: Very light footprint with tart, yeasty flavors. Wheat coming through showcasing a hint of mellon. As expected, there’s no hop presence. A bit of malt finish in back of palette. A bit of a “dusty flavor” (for lack of a better term). As the beer warms, it opens up revealing more of the orange. Mouthfeel: Big carbonation with a somewhat dry finish. Drinkability: Not best I’ve had, but a very refreshing beer. Nothing overly distinctive about the beer, but is amazingly drinkable on a hot day. Doesn’t really hit the palette with a ton of flavor as I typically like, but that makes it a bit more of a simple, thirst-quenching, refresher. Nice. I picked up this beer at The Bier Stein in Eugene. Jolly Pumpkin focuses on Belgian Style ales, and has been popping up more in my reading of American-made Belgian style ales. This is the first tasting of a Jolly Pumpkin beer on Brewerman, but the second one that I’ve had. I recall really enjoying the Oro de Calabaza as the first example of their product. Given the way this one went, I wish that I could more easily get their stuff here in Bend. 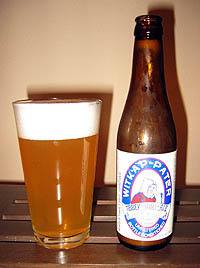 Appearance: White head of big bubbles sitting on top of a clear, straw colored beer. Big carbonation. Taste: Tartness and yeast play off the wheat carbonation and just barely-sweet base. The spice hits right at the beginning of the taste and slowly bleeds into the tartness that lingers after the swallow. There’s a slight bitterness, and the footprint left after the swallow is light. Green apple and pear flavors are present. A bit more tart than I’m used to with Wits, but very easy to enjoy. Mouthfeel: Lively carbonation, Light on the tongue. Drinkability: I liked it. At 4.8% ABV, this is a very refreshing beer that can easily be downed by a single person (at least it was easy for me 🙂 ). 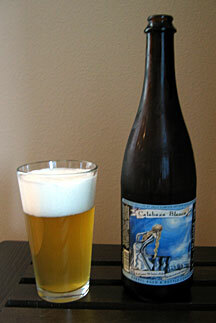 I wish that I could more-easily get my hands on more of Jolly Pumpkin’s beers. Very tasty. I know nothing of Port Townsend Brewing Company excepting the fact that it is in Port Townsend, WA (cool little town). This was another special delivery beer muled in from Seattle. 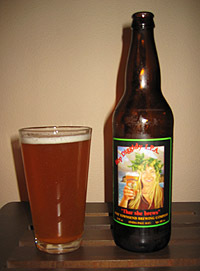 Port Townsend’s site says this weighs in at 5.5% ABV, and is intended to, “Give your mouth a blast of hops with this unique crisp ale”. Let’s take a look. Discosure: This has been sitting in my frige for about a month, so I can’t say that it is as fresh as it probably should be. Appearance: Small, white head that settles to a surface covering rather quickly. Hazy straw-orange color with some … wow, this is definitely unfiltered. Plenty of tasty bits suspended in the beer. Smell: Citrusy grapefruit on top of cotton candy. Some malt, but more sweet citrus than anything else. Nice. Taste: Good bitterness present. I’m guessing this is so quickly aparent because the malt profile itself seems too understated. This really makes the bitterness hit quickly and take over. The finish is clean with almost no aftertaste. Mouthfeel: Medium carbonation. It hits with an assertive hop bitterness and flavor, and is gone. Good, clean finish. Drinkability: I liked it, and am glad I tried it. It isn’t the hit-you-over-the-head-on-all-fronts style of American IPAs that I’m used to. The malts could be more discernable and balanced, but only just a bit. This is a refreshingly crisp, hoppy IPA, and I wouldn’t want to mess with that by sweetening it up with a bunch of malt. Just could use only a touch more malt character. This is my first review of an Avery beer. This came from a stash brought to Bend from my favorite beer store in Seattle by a man who I owe much to now. I owe him because this beer makes me say Daaaaaayum! It’s so tasty. I’m really looking forward to trying the other Avery beers that were delivered along with it now. Appearance: Off white head, beautiful orange color, big bubbles in head around glass. A little hazy, but plenty of light gets through to show off the color and the good carbonation bubbling up. Smell: I can smell the hops a foot away! BIG grapefruit. Some caramel/cotton candy notes follow, but they’re burried under the hops. Awesome aroma. Taste: Wow! Now that’s what an Imperial IPA is supposed to taste like. It is a huge flavor explosion. You can really get the hops here, and it artfully settles into a significant, but not overpowering bitter. While this is a hop monster, it’s not all bitterness. Much hop flavor sits on top of the substantial malt backbone. Residual sweetness keeps the hops from overwhelming the balance. A bit of alcohol heat at the end, but only the slightest suggestion. At 9.87% ABV, this is a pretty balanced Imperial IPA. Mouthfeel: Good carbonation dancing off the tongue. A bit of thickness stays on the back of the sip and keeps the flavor lasting a long time. Great finish. Drinkability: Wish I would have asked for more than one! I will pick up several for the cellar for sure if I come across it again. The Pike Brewing Company is a well-established micro out of Seattle, WA. Located by the Pike Market, this brewery has recently been sold back to its original founders, Charles and Roseanne Finkel, and I’m glad to hear it. These guys know the beer business. Charles Finkel is a pioneer in the early days of the craft brew industry. He started both Pike Brewing Company and Merchant Du Vin, a specialty beer importer back in the days before the American beer palate was what it is today. Because Pike Pale Ale has always been a staple in our house, I’m glad it is in capable hands. It is among my wife’s favorites, and we both liked it enough to serve it at our wedding. 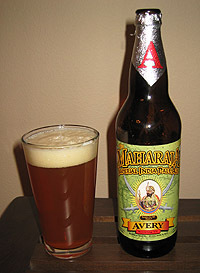 A straight-forward ale, it has a slightly assertive hop presence (but not too much), with a balanced aroma. Just a good tasting beer. Not much to say, except that it’s hard to find in central Oregon. Appearance: A nice amber, with a just a bit of haze. Smell: Both malt and hop hit at the same time. A very balanced aroma. Although there is some citrus, it’s not the in-your-face grapefruit that many NW pale and IPA’s exhibit. A slight hint of cotton-candy? Taste: Caramelized malt, distinct hop bitterness, slight pear or apple in the background. Clean flavor with a nice lingering bitterness at the end. Drinkability: A highly drinkable beer. This isn’t a sit-down-for-an-hour-as-the-beer-opens-up kind of brew. It is a great work-horse beer that both my wife and I like to keep well-stocked.